Ohio Open Doors coming to Highland Co. The Highland House Museum in Hillsboro will be open from 1-4 p.m. Sept. 15 as part of an Ohio Open Doors event. McClain High School and the Highland County Historical Society’s Highland House Museum will both be among more than 200 historic landmarks across the state celebrated during an Ohio Open Doors event Sept. 7-16. There will be other events in both Greenfield and Hillsboro coinciding with the Open Doors events being held there. All Ohio Open Doors events are free to the public. The Ohio History Connection (OHC), formerly the Ohio Historical Society, created Ohio Open Doors in 2016 to promote and inspire pride in Ohio’s heritage and to celebrate the 50th anniversary of the National Historic Preservation Act. Signed by President Lyndon B. Johnson on Oct. 15, 1966, the act has proven instrumental in transforming the face of communities from coast to coast, establishing the legal framework and incentives to preserve historic buildings, landscapes and archaeological sites. It drives economic revitalization by attracting investment, supporting small business, stabilizing neighborhoods and creating jobs, according to the OHC. Destiny Bryson, Visitors Bureau of Highland County executive director, is helping organize the local Open Doors events and said the plan is to hold them every other year. In Greenfield, McClain High School, which opened in 1915, will be open for tours from 10 a.m. to 4 p.m. Saturday, Sept. 8 and from noon to 4 p.m. Sunday, Sept. 9. On those same days and at the same times, the Greenfield Historical Society will have its Konneker Education Museum at 243 South St. and its B&O Train Depot on North McArthur Way open. Visitors will be able to browse displays at both sites and historical society members will be on hand to answer questions. “We just thought that since the high school is going to be open, people might enjoy seeing some of our facilities, too,” said GHS member Wendy Royse. In Hillsboro, the Highland House Museum will be open from 1-4 p.m. Saturday, Sept. 15. “A few people will be dressed in period costumes and they’ll talk about historic places in Highland County, guiding people through the museum and pointing out different things we have in our collections,” said Vicki Knauff, who operates the Highland House for the historical society. That same evening, the Highland County Historical Society will host its annual Log Cabin Cookout at 5 p.m. at the museum. “We encourage people to come and go through the museum and stay for the cookout,” Knauff said. Reservations are required for the cookout and can be made by calling 937-393-3392. The menu will include ham and bean soup, corn muffins, coleslaw, coneys, desserts and beverages. Donations will be accepted. The Ohio History Connection’s State Historic Preservation Office administers the National Historic Preservation Act in Ohio. Many of the landmarks featured in Ohio Open Doors events are on the National Register of Historic Places, which the National Historic Preservation Act created. “Ohio Open Doors shares stories of important landmarks right in our backyard, highlighting the history and unique nature of some of Ohio’s most treasured historic places,” Burt Logan, executive director and CEO of the Ohio History Connection, said in a news release. 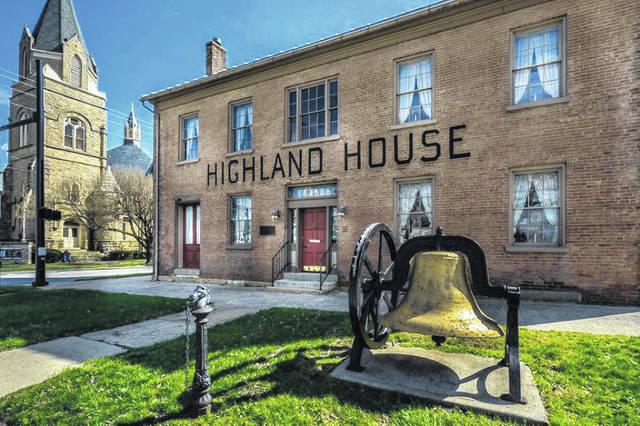 Jeff Gilliland can be reached at jgilliland@timesgazette.com or 937-402-2522.
https://www.timesgazette.com/wp-content/uploads/sites/33/2018/08/web1_Highland-House-pic.jpgThe Highland House Museum in Hillsboro will be open from 1-4 p.m. Sept. 15 as part of an Ohio Open Doors event.